Conferences bring together like-minded individuals for the chance to trade information, network and conduct business. Conferences are also an economic boon to the cities which welcome them, filling local hotels, exhibition halls and restaurants with paying customers. But not all cities are equally well set up to host conferences and receive this economic bounty. 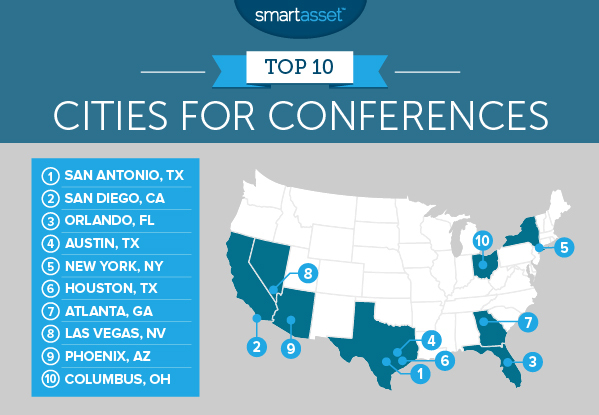 Below SmartAsset digs into the numbers to rank the best cities for conferences. In order to rank the best cities for conferences, SmartAsset looked at data for 43 cities. Specifically we looked at data on hotels, hotel costs, meal costs, airports, crime and restaurant and entertainment establishments. Check out our data and methodology below to see where we got our data and how we put it together. Trade-offs â€“ There tends to be a trade-off between the fun cities and the affordable cities. Cities like New York, Los Angeles and Las Vegas tend to have the most dining and entertainment options are also somewhat pricey. Repeat performers â€“ Six of last yearâ€™s top 10 made it into this yearâ€™s top 10. Charlotte, North Carolina; Irving, Texas and Albuquerque, New Mexico dropped to the top 20 this year. Texas, land of conferences â€“ Texas has three cities in our top 10. Texas cities are known for their size and affordability. Two things which make for successful conferences. San Antonio holds onto the top spot as the best city to hold a conference. This city ranks high because of the large number of hotels and their relative affordability. There are just under 350 hotels in San Antonio, the third-most in our study. A night in a hotel in San Antonio will also only set you back about $127. Another plus for conference attendees is the average meal cost. A meal for two at a mid-range restaurant costs $35, on average. San Diego jumps one spot from last yearâ€™s ranking to second. This sunny city can host conferences year-round in the San Diego Convention Center, an event space which has contributed $26.4 billion to the regional economy. This city has a good mix of medium-sized hotels (120) and large hotels (18) which allows for both large and small conventions to feel at home. In both metrics, San Diego ranks in the top 10. Orlando is a great place to host a conference for those looking for more affordable accommodations. According to our data, the average night in a hotel around Orlando will cost about $113 per night. If you use the right hotel rewards credit card, it may cost even less. Having a nice meal with your coworkers will also be more affordable around Orlando. A meal for two at a mid-range restaurant costs about $45, according to our data. 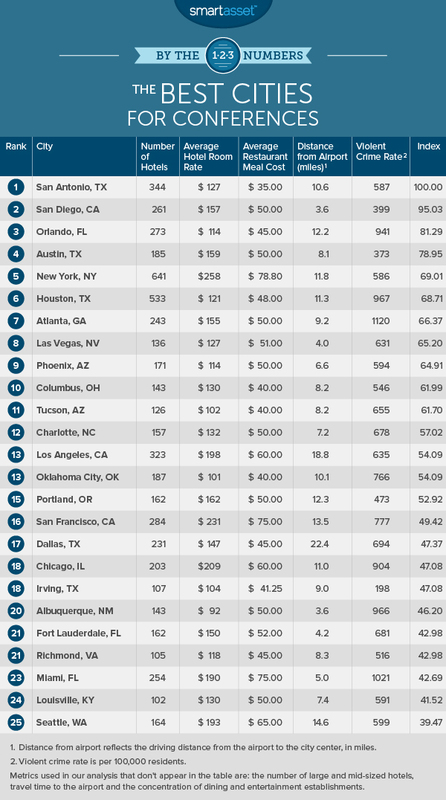 For that metric Orlando ranks sixth overall. The capital of Texas held steady, claiming the same rank as it had last year. Austin had good scores across the board, scoring in the top half in all but one metric. Austin particularly ranks high in convenience. Conference schedules are usually pretty packed so any time wasted getting to and from the airport is a hassle. According to our data, it takes only 17 minutes to get from downtown Austin to Austin-Bergstrom International Airport. New York is a great option for large conferences which need a lot of hotel rooms. According to the data, New York has the most medium-sized and large hotels in our study. Overall, according to the Census, there are 641 hotels in New York. Of course, anyone coming to New York for a conference should be willing to spend some money. The average night in a hotel costs about $260. Meals are expensive, too. You can expect to spend about $78 at a mid-range restaurant for a meal for two. New York also has one of the largest concentrations of dining and entertainment establishments in our study. Houston is another city with plenty of hotel space, giving it the ability to host conferences large and small. This includes the annual Offshore Technology Conference which in 2015 drew almost 95,000 attendees to the Magnolia City. Houston has 533 hotels, second-most in our study. The city does not rank as well when it comes to entertainment options. Only about 4.1% of establishments in Houston are dedicated to entertainment and dining, the second-lowest rate in our top 10. Hosting a conference in Atlanta is a smart move. Our data shows this city has plenty of hotel space with 243 hotels, 124 of which are medium-sized. In both those metrics, Atlanta ranks in the top 10. Getting from downtown Atlanta to Hartsfieldâ€“Jackson Atlanta International Airport should not be too difficult. We estimate that trip should take around 17 minutes by car. Las Vegas is world-famous for hosting conferences. The city is known for having large hotels and event spaces two things which any good conference needs. However, while Las Vegas has plenty of large hotels (15 in total), it only has 136 hotels overall. For that figure it ranks in the bottom half of the study. Vegas is boosted in the rankings due to its fun atmosphere and overall convenience. The airport is only four miles from the city center and 6.5% of all establishments are of the entertainment or dining variety. Phoenix is an affordable destination for conference attendees. Our data shows one night in a hotel should only cost about $114. Meals shouldnâ€™t be too pricey, either. The average cost for two people eating at a mid-tier restaurant is only $50. One concern might be space. There are 75 medium-sized hotels in Phoenix, a below-average rate. Columbus is the smallest city to crack the top 10. This means it may not be a great option for hosting the largest of conventions, but for medium or smaller ones this is a great city. Staying in a hotel here costs an average of $130 per night, a rate which is more affordable than most cities in the study. Attendees of conferences in Columbus will enjoy eating out. According to data from Numbeo.com, the average price of a meal for two at a mid-tier restaurant costs $40. Number of hotels. Data comes from the Census Bureauâ€™s 2015 County Business Patterns Survey. Number of medium-sized hotels. This is the number of hotels which have 20 â€“ 250 employees. Data comes from the Census Bureauâ€™s 2015 County Business Patterns Survey. Number of large hotels. This is the number of hotels which have over 250 employees. Data comes from the Census Bureauâ€™s 2015 County Business Patterns Survey. Restaurant meal cost. This is the average cost of a three-course meal for two people at a mid-range restaurant. We used Numbeo.comâ€™s October 2017 data. Distance between downtown and airport. This is the distance in miles between each cityâ€™s downtown area and the closest major airport. Data comes from Google Maps and Citylab.com. Violent crime rate. This is the number of violent crimes per 100,000. Data comes from the FBIâ€™s Uniform Crime Reporting Database for 2014 and 2015. Concentration of dining and entertainment establishments. This is the number of restaurants, bars and other entertainment establishments as a percentage of all establishments in each city. Data comes from the Census Bureauâ€™s 2015 County Business Patterns Survey. First we ranked each city in each metric. Then we found each cityâ€™s average ranking, giving full weighting to all metrics except airport distance and airport travel time. Those two metrics received a half weighting.We used these average rankings to create our final score. The city with the best average ranking received a score of 100. The city with the worst average ranking received a 0. Conferences can get expensive especially if your company is not footing the bill. But there are ways to save. Using a credit card which gets rewards or miles to book your flights to and from the conference can help to reduce costs. Or you could book your flight with points that youâ€™ve already accumulated. Minimize the number of night you are staying in a hotel. Hotels can be expensive so if youâ€™re spending two days at the conference, you could consider flying in during the morning of the first day and then flying out the night of the second day. That way you are only paying for one night at a hotel. If you travel and stay at hotels frequently, you may want to consider if a hotel credit card is right for you. These will likely make the most sense if youâ€™re already loyal to a hotel brand or willing to become loyal. Nick Wallace did the data analysis for this study. Copyright 2017 SmartAsset. All rights reserved. From http://www.smartasset.com. By Derek Miller.